E-publishing and e-books are hot now, but there was a time when some of us wondered if they would ever catch on. I was e-published before e-publishing was cool. In 1997, I finished my first novel, a 35,000 word YA novel titled Friendly Revenge. I had decided to write for the young adult market because in my youthful naïveté I felt that it would be the easiest market to break into. Friendly Revenge received excellent feedback and many glowing rejection letters, informing me that the YA houses were stocked up three years in advance. So after it finished making the rounds of the Christian houses, I consigned Friendly Revenge to my closet and began to work on another novel. But one afternoon, when I was reading Writer’s Digest, I noticed a fascinating sidebar. It said something like: “Savvy authors are checking out e-publishers.” The sidebar went on to list about five royalty-paying e-publishers. I was a little skeptical. After all, weren’t these guys just the electronic equivalent of vanity publishers? Didn’t they mostly sell junk? And even if I allowed someone to put my stuff on the Internet, what was to prevent people from stealing it? On the other hand, my manuscript wasn’t doing any good sitting in my closet. I decided to check out the e-publishers, and I was surprised at what I found. Two stood out to me. One was a site called Online Originals. It was based in Europe and sold mostly literary fiction. Online Originals held their authors to very high standards, and it showed. One of their books had even been nominated for a Booker Prize (a British literary award comparable to the Pulitzer). Another site had the unusual name, Hard Shell Word Factory and, yes, their logo was a turtle. This site sold mostly genre fiction, and it seemed a better fit for the suspense/thriller novel I had written. And besides, Hard Shell sold their books as 3 ¼ inch floppy disks; Online Originals did downloads only. I was willing to e-publish, but I still wanted some kind of physical product. And so I submitted Friendly Revenge to Hard Shell Word Factory. It went through a manuscript review process, just as I would have expected with a conventional publisher. And after it was accepted, they assigned an editor to me to help me improve my story. I even received royalties—sort of. Whenever royalty time came around, my wife and I would wonder if we’d receive enough for a cup of coffee and a bagel, or if it would just be enough for coffee. The checks were rarely enough to even buy coffee. I was published by a real, royalty-paying publisher. Of course, I couldn’t do book signings; I did disc signings. There was only one problem. Who was actually going to bother to sit down at a desktop computer to read a novel? Laptops weren’t all that common back then, and tablets, iPhones, Kindles, and Nooks hadn’t been invented. 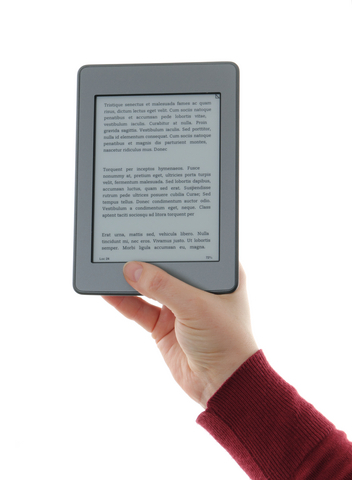 If there wasn’t a way people could read e-books, this bold new concept might never get off the ground. In 1998, it looked like the problem was solved. Someone introduced a dedicated e-book reader to the marketplace. But it wasn’t the Kindle. It was the Rocket E-Book. It didn’t quite work out that way, but that story’s for next month, when I tell you the gripping tale of The Rise and Fall of the Rocket E-Book. Do you have any early e-book stories that you would like to share? This entry was posted in Writing and tagged Booker prize, e-reader, Europe, Friendly Revenge, Hard Shell Word Factory, James H. Pence, Online Originals, Pulitzer prize, Rocket E-Book, Writer's Digest, YA novel by James H. Pence. Bookmark the permalink. Wow, James. I can honestly say I’ve never heard of the Rocket e-Book reader. I can’t wait to read next month’s installment. This was hilarious — particularly the portions about the super duper royalty check and disc signings. 🙂 Blessings! James, we writers need more of this info. It’s valuable and worth digesting and acting upon.